An important feature of this tax is a “border adjustment.” This provision would apply the tax to imports and exempt exports. The application of the border adjustment moves the corporate income tax from an “origin-based” tax to a “destination-based” tax. Both origin- and destination-based taxes are trade-neutral. As such, switching from one to the other does not alter the trade balance, nor put the United States at a trade advantage or disadvantage. Although economists do not expect there to be a trade advantage to switching to a destination-based tax, there are a few positive aspects of doing so: it would prevent profit shifting, eliminate the need for complex anti-base erosion provisions, and broaden the tax base within the budget window. There are also challenges with this approach. It is not known yet whether this provision could be struck down by the World Trade Organization (WTO). In addition, a few implementation and transition challenges may exist. In June 2016, the House Republicans released a comprehensive tax reform plan. The plan proposes to significantly reform the way in which businesses are taxed in the United States by converting the current corporate income tax into a “destination-based cash-flow tax” (DBCFT). One of the most significant features of this plan is a border adjustment. The border adjustment would eliminate the ability for companies to deduct the cost of imports. At the same time, it would eliminate the tax on income attributable to exports. This would shift the current corporate income tax from an origin-based tax—one that applies to the production of goods and services in the United States—to a destination-based tax—one that applies to the consumption of goods and services in the United States. This goal of this paper is to explain the role of the border adjustment in the GOP plan and its likely effects. The paper reviews the basics of origin- and destination-based taxes, how they interact with trade, and why economists expect there to be no net impact on the economy or the trade balance from switching from an origin-based tax to a destination-based tax. The paper will also review some positive aspects of the border adjustment as well as some potential challenges with its enactment. In June 2016, the House Republicans released a tax reform plan, titled “A Better Way.” The plan would reform both the individual income tax and business taxation in the United States. On the individual side it would lower marginal tax rates on wage, investment, and business income; broaden the tax base; and simplify the tax code. The plan would also lower the corporate income tax rate to 20 percent and make a number of significant changes to its tax base. Finally, the plan would eliminate federal estate and gift taxes. Arguably, the most significant reform the House GOP’s tax plan makes is to how businesses in the United States are taxed. Businesses would be able to fully expense their capital investments rather than depreciate them over a number of years or decades. Businesses would no longer be able to deduct their net interest expense against their taxable income. Foreign profits would no longer be subject to domestic taxation. The corporate income tax would be “destination-based,” meaning that the plan would make the U.S. income tax border-adjustable. The stated goals of this reform are to grow the economy, increase the competitiveness of U.S. firms, and simplify the business tax system. In addition, supporters of the plan state that enacting the border adjustment would eliminate the “made in America tax” and increase the competitiveness of U.S. products on world markets. The most novel change the House GOP plan makes to the current tax code is that it applies the destination principle to the U.S. business income tax. This is done by enacting a “border adjustment.” In the plan, businesses in the United States would no longer be able to deduct the cost of purchases from abroad, or imports. At the same time, businesses would no longer be taxed on the revenue attributable to sales abroad, or exports. A border adjustment is a relatively new concept in the context of a business income tax. However, border adjustments are very common throughout the world, are natural components of most consumption-based taxes, and date to the 1860s. Many retail sales taxes in the United States are destination-based and have border adjustments, and most value-added taxes (VAT) throughout the world employ border adjustments. The most basic way to understand the border adjustment is to understand the change it makes to the business income tax base. Generally, a country has two options when setting a tax base. It can levy an origin-based tax; a tax on the production of goods and services in a country. Or, a country can levy a destination-based tax; a tax on the sale of goods and services in a country. 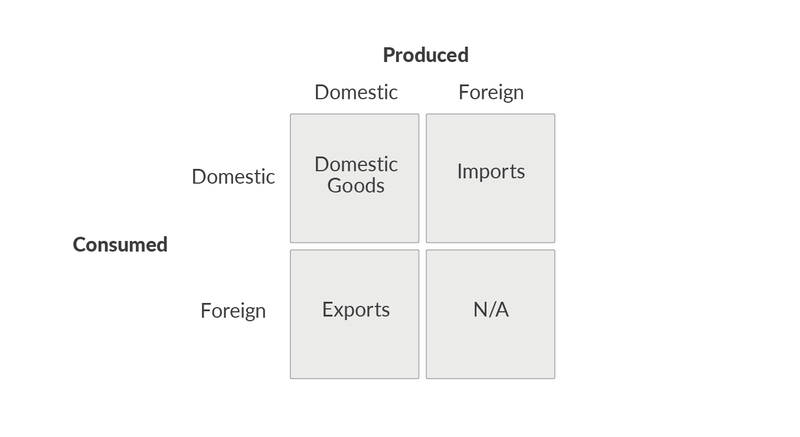 An easy way to think about the difference between origin- and destination-based tax systems is to organize goods and services in an economy into three categories: 1) Purely domestic goods and services, those that are both produced and consumed in the U.S.; 2) Goods produced domestically and consumed in foreign countries, or exports; 3) Goods produced in foreign countries and consumed in the U.S., or imports. An origin based-tax is one that taxes goods based on where they are produced, regardless of where they are consumed. As such, an origin-based tax applies to both goods produced and consumed domestically (purely domestic goods) and to goods produced in the U.S. and consumed in foreign countries (exports). In the two-by-two matrix (below), an origin-based tax is applied to the top and bottom boxes on the left. An origin-based tax is neutral with respect to domestic production. Generally, the current corporate income tax is an origin-based tax: the tax falls on the production of goods in the United States, regardless of where they end up. A destination-based tax is one that taxes goods and services based on where they are consumed, regardless of where they are produced. 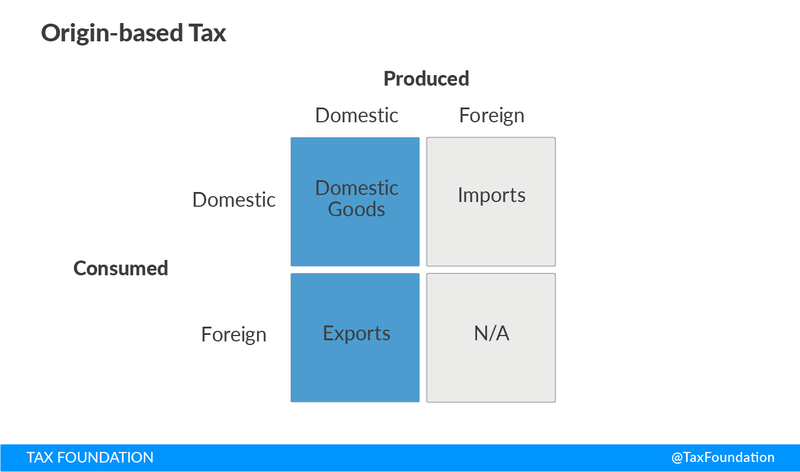 In our two-by-two matrix, a destination-based tax system is levied on goods and services in the two top boxes: goods produced and sold domestically (purely domestic products) and goods produced in foreign countries and sold domestically (imports). A destination-based tax is neutral with respect to domestic consumption. VATs throughout the world are destination-based. Also, most retail sales taxes are destination-based. Individuals pay state sales taxes on all goods consumed in a state, regardless of where those goods were produced. A destination-based tax is not the same as a tariff. As the diagram above shows, a destination-based tax falls on all domestic consumption, whether it is produced in the United States or produced in a foreign country. While a destination-based tax applies to imports, it also falls on domestically produced goods as well. By contrast, a tariff applies only to imports, creating a higher price for traded goods relative to domestic goods. While destination-based taxes are neutral, tariffs are not. A striking difference between origin-based taxes and destination-based taxes is that they are applied to opposite sides of the trade balance. It appears as though an origin-based tax punishes exports and subsidized imports while a destination-based tax does the opposite. This view—that origin- and destination-based taxes have different impacts on the trade balance—is wrong. Both an origin-based tax and a destination-based tax are trade-neutral and switching from one to another does not impact the trade balance. This is because exports and imports are two sides of the same coin. Exports are needed to pay for imports and imports are the returns to exports. As such, taxing exports ends up reducing imports and taxing imports ends up reducing exports. Trade between countries is a positive sum activity. To take a stylized example, when South Korea sells laptop computers to the United States, it is doing so in order to purchase airplanes from the United States. And the United States sells airplanes to South Korea in order to purchase Korean laptops. A balance between imports and exports occurs over the long run because Americans would not trade with Koreans unless they knew they were going to get something in return and vice versa. In reality, trade doesn’t always net out between two countries in every single year. In some years South Korea may sell more laptops to the United States than the United States sells airplanes to South Korea, or the U.S. may sell more to South Korea than it buys. Annual trade imbalances are driven by capital flows between countries. When Korea sells goods to the United States, there is a corresponding capital outflow from the U.S. to Korea, as Korea trades its won (currency) for U.S. assets such as dollars, stocks, or bonds. So, if Korea sees additional investment opportunities in the United States, it will sell the U.S. more laptops in order to procure more U.S. assets instead of immediately purchasing more airplanes from the U.S. This inflow of capital to the United States creates a trade deficit, which can persist as long as foreign countries see investment opportunities in the United States. This relationship among the flows of goods, services, and capital is a basic accounting identity in economics and is true for every country in every year. Countries that run trade surpluses are simultaneously running capital account deficits, because they are saving or investing, on net, in foreign countries. Countries that run trade deficits are simultaneously running capital account surpluses and are receiving net capital inflows. Simply put, a country’s exports are the price it pays in order to purchase goods from or invest in foreign countries. Likewise, imports are the returns, or income, a country receives from international trade and investment. Increases or decreases in one end up affecting the other. Understanding that imports and exports are two sides of the same coin makes it easy to understand why both an origin- and destination-based tax impact trade in the same way. An origin-based tax, which falls on exports and exempts imports, ends up reducing imports in the long run. This is because, if the United States does not produce as many exports, it is not able to purchase as many imports. Similarly, a destination-based tax, which falls directly on imports and exempts exports, ends up reducing exports in the long run. This is because, if foreign countries cannot export as much to the United States, it becomes harder for them to purchase our exported goods. 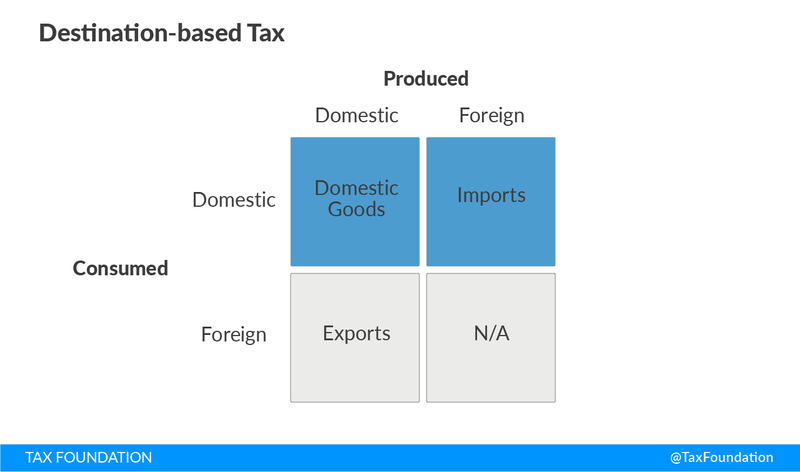 Assuming both taxes are broad-based and have the same rate, an origin-based and a destination-based tax should impact the tradable sector in the same way, even though one falls on exports and the other falls on imports. Since an origin-based tax and destination-based tax impact trade in the same way, switching from an origin-based tax to a destination-based tax, such as the GOP proposal would have no net impact on trade. When the border adjustment is applied, either the U.S. dollar would appreciate or the domestic price level would increase, so that imports and domestic goods remain on an equal footing compared to current law. In general, most economists believe that prices will adjust through changes in nominal exchange rates. Specifically, the dollar would appreciate relative to foreign currencies to eliminate the change in prices created by the border adjustment. As such, foreign imports would cost precisely as much as they do, net of tax, under current law in the United States. And U.S. exports would cost precisely as much as they do, net of tax, under current law in foreign markets. The intuition behind this is pretty simple. Changes to the trade of goods and services correspond to changes in the trade of currencies. This is because individuals need currencies in order to purchase goods in services in the world market. So, changing supply or demand for imports and exports through taxation should have a corresponding impact on the supply and demand for currencies. A switch to a destination-based tax would simultaneously boost the demand and reduce the supply for U.S. dollars, causing an appreciation of the U.S. currency. Alternatively, if currencies do not or cannot adjust, the domestic price level would adjust to eliminate the price differential between imports and domestic products. In a case without any currency adjustment, the initial swap to a destination-based tax would create a temporary price differential between domestic and foreign goods. This price differential would increase demand for domestic goods and lower demand for foreign goods and would shift economic activity towards domestic goods. Over time, this would drive up domestic prices and wages, which would eventually equalize the price of foreign and domestic goods. However, this outcome is very unlikely in a country like the United States, which has flexible exchange rates. An important empirical question is whether the swap from an origin-based tax to a destination-based tax would result in a quick adjustment to the exchange rate, or a more gradual adjustment through domestic prices. Most economic literature dating to the 1950s agrees on the theory that destination-based taxes are fundamentally trade-neutral and that border adjustments do not afford a trade advantage or change the balance of trade. Most literature also agrees that theoretically, prices change mainly through adjustments in exchange rates. While very little empirical work has been done specifically on how border adjustments impact exchange rates and prices, some related empirical work is helpful in understanding the likely effects of enacting a border adjustment. At the same time, literature on “exchange rate pass-through,” which is essentially the extent to which adjustments in nominal exchange rates are translated into domestic prices. This work shows that changes in exchange rates may not immediately translate into lower domestic prices and may result in the tax being passed-through to consumers or producers in the short run. This is due to goods being priced in a common currency or pricing contracts that are fixed over some time. Although an origin-based and destination-based tax are economically equivalent in terms of their impact on trade, there are actually some non-economic advantages that may make the switch to a destination-based tax worthwhile. Paired with other aspects of a DBCFT, the border adjustment would make many strategies of profit shifting under current law impossible. It would also be possible to lift some of the complex anti-base erosion provisions that typically come with origin-based tax systems. Lastly, a border adjustment in a DBCFT raises a significant amount of revenue in the budget window, which can be used to finance other important reforms such as full expensing and lower marginal tax rates. One advantage of a destination-based tax over an origin-based tax is that destination-based taxes prevent the type of profit shifting that erodes the tax base under our corporate income tax. This is because a destination-based tax basically ignores the types of transactions that make profit shifting possible. Under current law, a company that imports $60 worth of goods from a foreign subsidiary can deduct those costs against taxable income in the United States. If that subsidiary is in a lower tax jurisdiction than the United States, it has an incentive to overprice the import it sells to the U.S. parent company. This shifts profits from the United States to the lower tax jurisdiction. Likewise, a company that exports from the United States to a subsidiary in a lower-tax jurisdiction has the incentive to underprice the export it charges its subsidiary. Both of these maneuvers reduce the worldwide tax burden of the corporation and reduce revenue collections in the United States. Under a destination-based system, the transactions that allow a reduction in tax liability through profit shifting are eliminated. Since the cost of imports cannot be deducted, it doesn’t matter what a company charges itself; it cannot deduct its import cost and thus cannot change its domestic tax liability. Likewise, exports are excluded from taxable income, so a company charging itself $1 or $1 billion for an export has no bearing on its U.S. tax liability. The destination-based tax also neutralizes other profit-shifting strategies. Placing intellectual property (IP) in foreign countries and overcharging your domestic operations in order to shift profits no longer works, because royalty payments—the cost of importing IP—are no longer deductible. Likewise, the DBCFT eliminates the net interest expense deduction, which eliminates the benefit of loading up domestic corporations with debt in order to strip the tax base through interest deductions. In fact, the incentives would go the other way under this tax system. Profit shifting will not change a company’s U.S. tax liability, but it would still change its foreign tax liability. As such, companies would have an incentive to locate profits in the United States. These profits would not be taxed in a foreign jurisdiction nor would they be taxed in the United States. This could have a slight positive economic benefit to the extent that companies shift real activity to the United States along with their profits. Some have argued that tax avoidance may still be possible under a destination-based business tax. For the most part, these examples of profit shifting are ways in which companies can strip the tax base of foreign countries. While there is a legitimate debate over whether the United States should change its business base from domestic production to domestic consumption, it is not clear why we should care about the tax base of foreign countries. A legitimate issue of tax avoidance is the issue with direct cross-border business-to-consumer sales, especially of services and digital goods. Unless addressed, a foreign software company could sell its software directly to a customer in the United States. In this case, there is no business that is denied a deduction, and the tax could be avoided. As a result of a destination-based tax’s impact on profit shifting, it is not necessary to apply the anti-base erosion rules that usually come with origin-based tax systems, which would allow for much simpler tax system. One common goal of tax reform is to move from the current worldwide tax system to a territorial tax system. Although a territorial tax system, which exempts foreign-source income from domestic taxation, is superior to current law, which requires corporations to pay tax on their worldwide profits, it does suffer from base erosion concerns. A company that successfully shifts profits out of the U.S. and repatriates those profits tax-free can reduce their U.S. tax burden. Nearly all developed countries that have territorial tax systems have rules that prevent gaming, and some are much stricter than the current rules in place in the United States. In a sense, the House GOP proposal uses the border adjustment as an anti-base erosion provision instead of enacting stricter base erosion rules as part of the switch to a territorial tax system. However, some rules would still need to be defined in order to prevent tax avoidance that is possible under destination-based tax systems. Another advantage of the border adjustment is that, over the budget window, the border adjustment raises more than $1 trillion in revenue with relatively little economic harm and in a relatively progressive fashion, meaning it falls most heavily on high-income taxpayers. In the House GOP plan, this revenue is used to finance other provisions, such as full expensing of capital investment and a lower rate on corporate income, which would significantly boost the long-run size of the economy. The reason the border adjustment raises revenue over the budget window is that, currently, the United States is running a trade deficit. This means that imports, which are taxed under a destination-based tax, exceed exports, which are exempt. Currently, the trade deficit is roughly $500 billion on an annual basis. The Tax Foundation and other organizations estimate that the border adjustment would raise about $1 trillion over the next decade. It should be noted, however, that this boost in revenue is not permanent. Over an infinite horizon, a border adjustment theoretically raises no revenue in present value terms. Today, the United States imports more than it exports, meaning that border adjustment raises revenue, but in the future the United States could begin to run a trade surplus. If so, the border adjustment will lose revenue from this provision. However, it is not clear whether the United States will begin running a trade surplus any time soon, especially since U.S. assets are still very attractive throughout the world and the dollar remains the world reserve currency. Although the destination-based tax proposed by the House GOP has positive qualities, there are potential challenges with this approach. Specifically, it is not yet clear whether it will comply with WTO rules. In addition, the plan in its current form may not properly treat exporters, meaning that they could be overtaxed in some situations. Lastly, the plan could have some transition costs worth considering. Probably the most significant challenge the House GOP’s DBCFT faces is the rules of the World Trade Organization. Although there is no economic reason to think the border-adjustment in the tax plan would give the United States an unfair trade advantage, it could still be perceived that way by the current WTO rules. Generally, WTO rules allow for border adjustments on imports and exports, but under specific circumstances. First, a border adjustment is typically allowed under an indirect tax, like an excise tax or credit-invoice VAT and not a direct tax such as a corporate income tax. Second, a tax with a border adjustment needs to treat domestic and foreign goods equally to avoid discrimination against imports. Third, exports cannot receive a larger tax rebate (or exemption) than the tax levied (or otherwise due) on the same goods if they were intended for the domestic market. It is unclear whether countries would challenge the House GOP plan on the issue of direct vs. indirect taxation, especially since Japan’s VAT with a border adjustment, which could be considered a direct tax, has gone unchallenged since its inception in the early 1990s. However, the tax, as currently designed, would face a higher risk of a WTO challenge on the grounds that it discriminates against imports in favor of the same domestic goods. Under a typical VAT, domestic goods and foreign goods are treated identically and face full tax on their value added at every point in the value chain. Under the House GOP plan, this would not be the case. Companies that produce in the United States would not be taxed on all of their value added, because they would be able to deduct their wages paid to U.S. employees; by contrast, the full value of foreign goods sold in the United States would be taxed. This issue isn’t relevant in terms of how the House GOP plan would impact trade from an economic perspective, but it is still a serious legal issue. Allowing a wage deduction against a border-adjusted VAT (essentially equivalent to the House GOP plan) is the same as a country raising a VAT and simultaneously cutting the employer-side payroll tax. WTO rules permit these two simultaneous changes, but the WTO probably wouldn’t analyze the impact of the DBCFT in the context of a country’s entire tax system. Instead, the WTO would likely examine only the DBCFT’s tax burden on an imported product and a domestic like product, as used by identical corporations, at various points in the value chain. It is not clear whether the final proposal would run into these issues. Some argue that there is not yet enough detail on the plan to determine whether it violates the United States’ WTO obligations. Even if the WTO ruled in favor of the House GOP plan, many countries would have the incentive to apply stricter anti-base erosion provisions and name America a tax haven because foreign companies would attempt to shift profits into the United States as a means to avoid foreign taxes. As with any new tax system, there are also questions remaining about the plan’s implementation which could have an impact on how well the border adjustment works. Two major issues are making sure exports get a full rebate and that all imports are subject to tax. In order for a border adjustment to work, the amount of tax paid on imports needs to be directly offset with an exemption of equal size for exports. Under a typical credit-invoice VAT, an exporter gets a full tax credit for VAT paid on exports, which can sometimes result in negative tax liabilities. It is possible that the GOP DBCFT won’t work the same way. The current proposal provides companies with an income exclusion for exports. For companies with profits, this exclusion would act just like the credit provided by most VATs. For companies with little or no profits, however, this income exclusion will generate a net operating loss (NOL) that the company would need to carry forward into future years. The House GOP plan does propose to allow companies to carry their net operating losses forward for an unlimited period of time and adjust them annually for a real return on capital and inflation, meaning that the losses would never lose their value. However, this could still be problematic. Some exporters may never have taxable income against which to deduct these losses, thus never receiving a refund, which could put exporters at a competitive disadvantage. One solution to this issue would be to allow companies to get immediate refunds on their losses. This way, companies would be able to receive the cash benefit of the export rebate immediately. The downside of this approach is that it requires the Treasury to potentially write checks to highly profitable companies. A second possibility could be to allow companies to sell NOLs. Exporters could get an immediate benefit for their exports while providing deductions for companies that could use them. Another challenge is making sure all imports are subject to the border adjustment. The goal of the border adjustment is to make sure that the sales of all goods and services in the United States are taxed, including goods and services sold to consumers. It can be challenging to make sure that direct foreign sales to consumers are taxed, because there is no entity that is denied a deduction for the import. Some have suggested either requiring consumers or foreign companies to remit the tax. The first would likely present political and compliance problems. The second would require foreign companies to register to pay tax in the United States and may have some administrative challenges. As with any major tax reform there are always trade-offs and transitional impacts to consider. The first issue is the speed at which prices adjust to the transition to a destination-based tax. Theoretically, whether nominal exchange rates adjust or domestic prices adjust, the result ends up neutral and consumers are not impacted. As discussed above, the literature suggests that exchange rates would adjust, but it could take time for that to translate through prices. As a result, the tax could fall on consumers and producers in the short run. However, it is too early in the tax reform debate to assume any particular short-run impact of the plan. This is because it is unclear what transition rules would be part of the House GOP proposal. For example, lawmakers could phase in the border adjustment over a number of years. The downside of this, however, is it would reduce the provision’s effectiveness as a base broadener. A consequence of applying the border adjustment and switching to a DBCFT is that foreign assets held by Americans would decline in value. The appreciation of the dollar due to the implementation of the border adjustment would make assets denominated in foreign currencies less valuable. For example, an individual with an investment that yields returns in Euros would find that those returns net fewer dollars after the appreciation. According to one estimate, the one-time devaluation of the stock of this wealth would be roughly $2.4 trillion. At the same time, foreigners who own U.S. assets would receive a windfall as their U.S. dollar profits increase. It is important to note that while this hit to wealth due to the border adjustment is real, the broader GOP plan would permanently boost Americans’ incomes at the same time. Another consequence of dollar appreciation is that debts denominated in U.S. dollars will become more expensive in foreign countries. This is because a foreign country or business would need to raise money in the local currency and convert it into more expensive dollars to pay the debt. Emerging markets may be hit hardest by this. 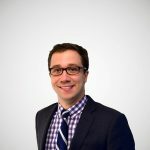 However, many policy changes in the United States and natural movements in the market have impacts on the value of the U.S. dollar that could impact dollar-denominated debts. It isn’t clear why a border adjustment would be a special case. The House GOP proposal to convert the corporate income tax into a “destination-based cash-flow tax” would be a significant departure from how the United States currently taxes businesses. It would essentially eliminate the tax wedge on new investment and eliminate many distortions inherent in our current system. However, most people are paying more attention to the border adjustment, which would move the U.S. income tax to a destination-basis. Some commentators believe that a border adjustment would either be a boon to U.S. production or a detriment to consumers. Yet, economic theory shows that this particular aspect of the plan will have a limited-to-no long-run economic impact. Although there are no expected trade-related economic gains from implementing a border adjustment, there are advantages to this approach, especially in limiting tax avoidance and simplifying certain aspects of the code. This approach would also raise potential challenges with trade partners, implementation, and transition. However, overall, it is a serious policy worthy of consideration. The U.S. corporate income tax deviates from a pure origin-based tax by subjecting foreign profits to domestic taxation. This in effect also partially taxes imports and goods produced and consumers in foreign countries. One can readily see this in the data. On net the United States ran a trade deficit of $477 billion in 2015. This trade deficit in goods and services was matched with capital inflows of $477 billion in the same year. This relationship can be formalized as M – X = I – S where M are imports and X are exports. I is net foreign income or capital inflows and S is net foreign saving or capital outflows. European Coal and Steel Community, High Authority, “Report on the problems raised by the different turnover tax systems within the Common Market” (Tinbergen Report) (European Coal and Steel Community, High Authority, 1953). Shibata, Hirofumi, “The theory of economic unions: A comparative analysis of customs unions, free trade areas, and tax unions,” in Carl S. Shoup ed., Fiscal harmonization in common markets, Vol. l: Theory (New York: Columbia University Press, 1967), 145-264. Johnson, Harry and Mel Krauss, “Border taxes, border tax adjustments, comparative advantage, and the balance of payments.” Canadian Journal of Economics, November 1970, 3 (4), 595-602. Meade, James E., “A note on border-tax adjustments.” Journal of Political Economy, September-October 1974, 82 (5), 1013-1015. Quarterly Journal of Economics, November 1977, 91 (4), 555-578. Grossman, Gene M., “Border tax adjustments: Do they distort trade?” Journal of International Economics, February 1980, 10 (1), 117-128. Feldstein, Martin and Paul Krugman, “International trade effects of value-added taxation,” in Assaf Razin and Joel Slemrod eds., Taxation in the global economy (Chicago: University of Chicago Press, 1990), 263-278. Alan Auerbach, “The Future of Fundamental Tax Reform.” The American Economic Review. May 1997. Kyle Pomerleau, “Details and Analysis of the 2016 House Republican Tax Reform Plan.” Tax Foundation. July 5, 2016. Kyle Pomerleau, “Details and Analysis of the 2016 House Republican Tax Reform Plan.” Tax Foundation. July 5, 2016. James R. Nunns, Leonard E. Burman, Jeffrey Rohaly, Joseph Rosenberg, Benjamin R. Page, “An Analysis of the House GOP Tax Plan.” Tax Policy Center. September 16, 2016. The House GOP blueprint has proposed eliminating NOL carrybacks. Emmanuel Fahri, Gita Gopinath, and Oleg Itskhoki, “Border Tax and the US Dollar.” http://www.afr.com/opinion/columnists/border-tax-and-the-us-dollar-20170130-gu1yj0. This is a figure net of liabilities. U.S. debts will now be easier to pay off with a stronger U.S. dollar. The dollar has appreciated by more than 20 percent in the last two years. This has the exact same impact on dollars-denominated-debts as a policy change that increases the value of the U.S. dollar.